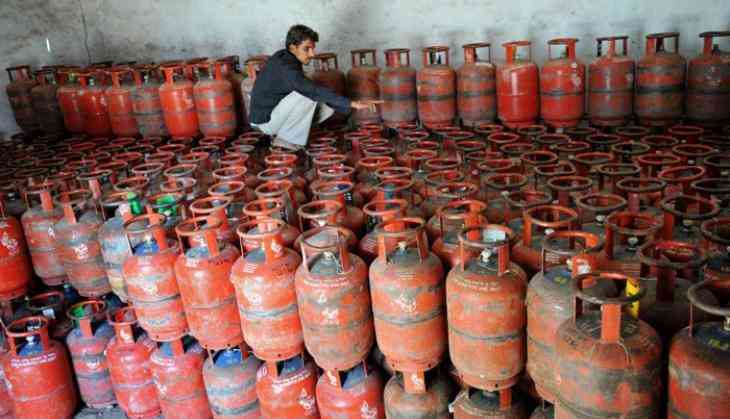 Domestic cooking gas (LPG) price has been hiked by up to Rs 32 per cylinder -- the steepest increase in six years -- following implementation of the Goods and Services Tax (GST). Subsidised LPG rates have been increased to Rs 477.46 per 14.2-kg cylinder from Rs 446.65 in Delhi after GST was implemented from July 1. Besides Delhi, subsidised LPG price has been hiked by Rs 31.67 per cylinder to Rs 480.32 in Kolkata and Rs 31.41 in Chennai to Rs 465.56, according to information available from oil companies. In Mumbai, where a VAT of 3 per cent was applicable previously, the price has gone up by Rs 14.28 to Rs 491.25 per cylinder. This is the steepest increase in domestic subsidised LPG rate since June 25, 2011, a hike of Rs 50 per cylinder, which was necessitated due to a jump in international oil prices. Every household is entitled to 12 cylinders of 14.2-kg each at subsidised rates in a year. Any requirement beyond that has to be purchased at market price. The rate of market-priced 14.2-kg cylinder in Delhi is Rs 564. Sources said the 5 per cent GST resulted in a Rs 26.88 increase in rate per cylinder in Delhi and the remaining hike of about Rs 3 is because of the decision since June last year to raise prices by about Rs 2 to cut the subsidy. The rate of non-subsidised LPG, which consumers pay after exhausting their quota of below-market priced bottles, went up by Rs 11.5 to Rs 564. Such bottles attract an 18 per cent GST.